Captain Adam Crouthamel has been fishing the waters of Cape May, New Jersey his entire life. His fishing experience includes both inshore and offshore fishing in the Northeast, as well as fishing both Southern Florida and California. He has been running and fishing his own boats since the age of fifteen. He pursues all of the inshore game fish of Cape May, as well as bluefin and yellowfin tuna, with incredible fervor. Striped bass are his specialty, and he has spent countless days pursuing these incredible game fish in the famed Cape May rips. A published author for fishing magazines, Captain Adam has written various articles on fishing for tuna, striped bass, sea bass, and blackfish for publications such as THE FISHERMAN and NEW JERSEY ANGLER MAGAZINE. He has worked with SALTWATER SPORTSMAN MAGAZINE on their NATIONAL SEMINAR SERIES, speaking about striped bass, fluke, and wreck fishing. Adam was also featured in an episode of WORLD OF SALTWATER FISHING with George Poveromo on the NBC Sports Network in an episode titled, South Jersey Fluke Bonanza! With his marine science background, Captain Adam will insure that your trip is successful and informative. 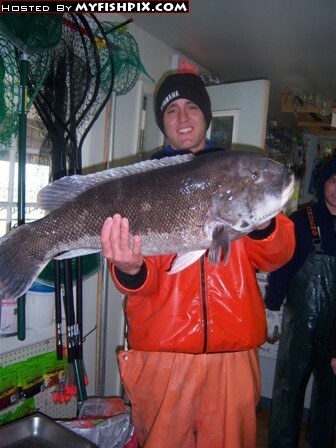 His knowledge of the waters surrounding Cape May and the fish they hold is unparalleled. When fishing aboard the Adam Bomb III, you can rest assured that Captain Adam will do everything to make your trip as successful, enjoyable, and memorable as possible. We look forward to fishing with you soon.